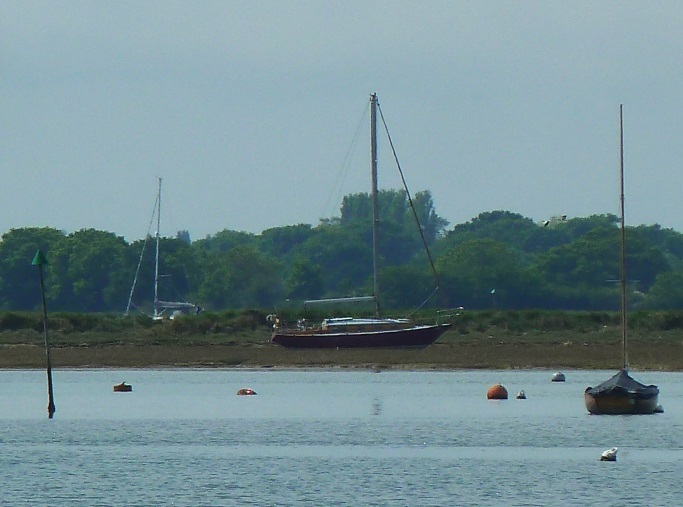 I have to say Keyhaven is one of my favourites. It's a shallow, presumably natural harbour protected from the prevailing weather in pretty much most directions. 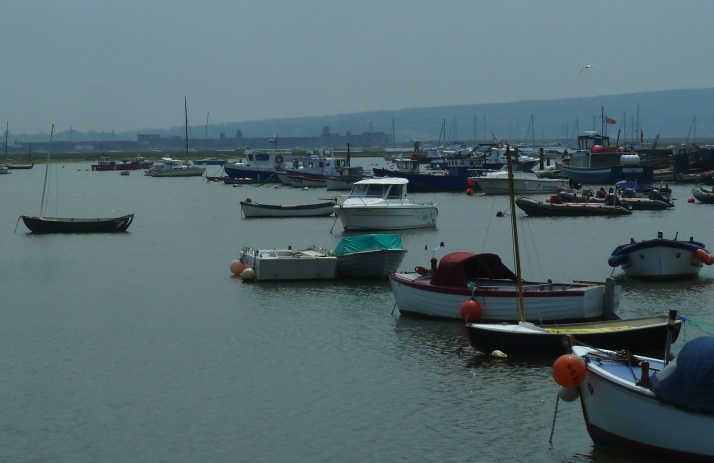 There's an interesting mix of small day boats, motorboats, RIBs, local fishing boats and of course the Keyhaven SCOW fleet. Always seems to be lots going on. Now beauty being in the eye of the beholder and all that, but when fellow blogger Joe - Horse's Mouth commented recently about some of the horrors being imposed on marine craft in the name of design I kind of agree with him, or at least I agree that I don't understand some of the stylistic design being applied to modern yachts and especially to motor boats. 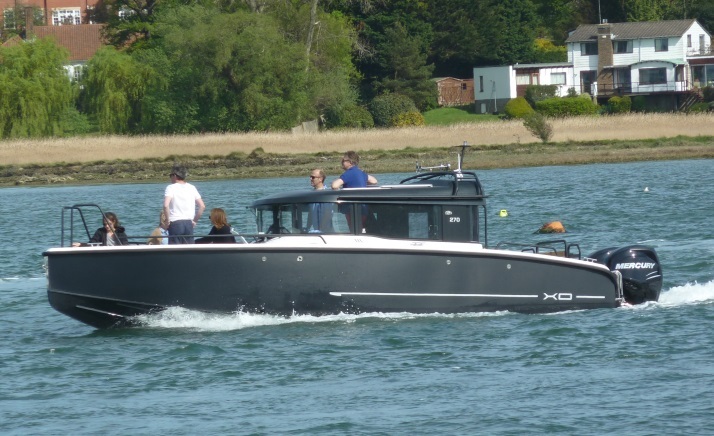 No doubt those more in touch with current design thinking will say that a new breed of designers are pushing the boundaries to find a new marine form and aesthetic, which is all very well but is it attractive and does it function? New London Mayor Sadiq Khan's recent announcement that Transport for London would no longer run ads which could cause body confidence issues, has clearly not resonated down here on the coast. 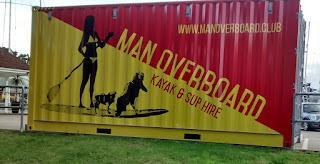 Our local kayak and SUP (stand up paddle board) outfit have a new base which sports the clear message that getting out on the water is for the young and beautiful. Fortunately the BB readership while admittedly not at the cutting edge of hip fashion, are in the main pretty robust. So don't worry about that beer belly and beard, get out on the water while the sun shines. The aftermath of Easter's storm Katy is still in evidence at Emsworth. 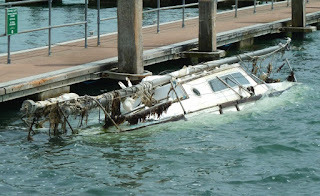 The yacht alongside the tiwn pontoon was completely awash at HW. Further out the the harbour a stranded yacht sits high and dry, presumably waiting for a combination of spring tide, low pressure, southerly wind and maybe a substantial tug before she will float/get pulled off. That is if there's no damage and she's not taking water. 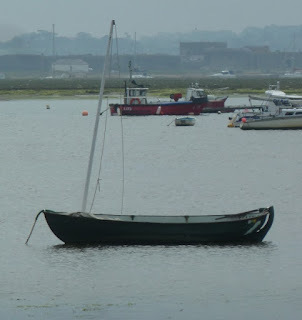 I've always like the Drascombe Scaffie for it's simplicity, a perfect boat for pottering around the harbours and estuaries and while I'm not normally really taken by double ender's, the Scaffie is undeniably pretty. The lack of a centreboard, and the associated space of the case and restrictions to the cockpit are good features, but presumably the trade off is lack of pointing ability. 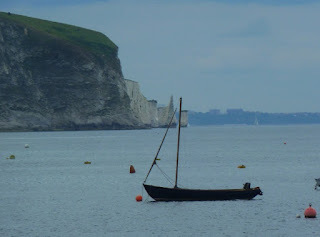 The original Drascombe Lugger is also a handsome boat, bigger and heavier to handle ashore than the Scaffie. 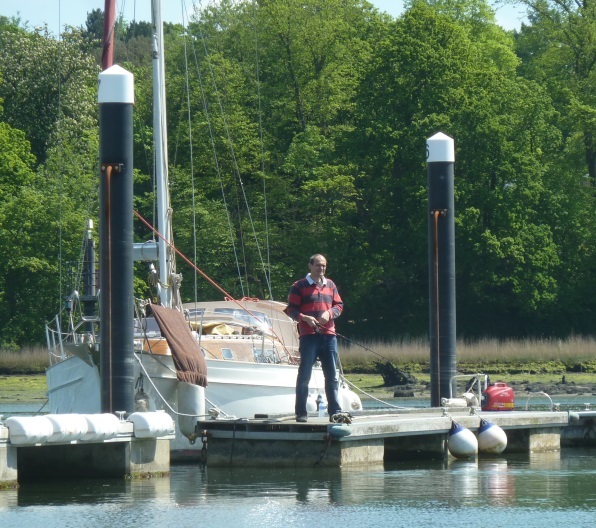 The drop through rudder demands care in very shallow waters, at least compared to a transom mounted lifting rudder. 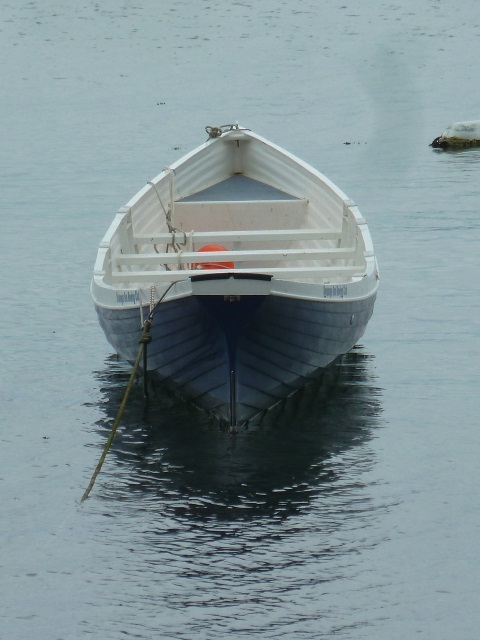 Overall two fine boats, ideal for getting out on inshore waters. 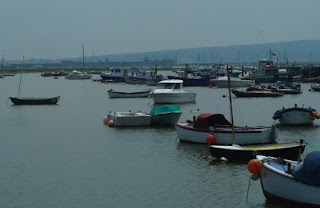 Too many boats, too little time. With its wide and sheltered bay Swanage is a great location for coastal rowing. Afloat on moorings were two of these lovely gigs. 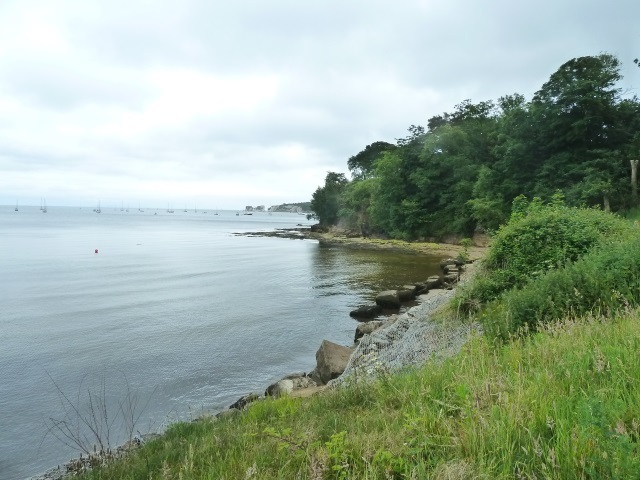 My morning run takes me through the local boatyard where Grand Soliel "Lickitysplit" unfortunately dropped from her cradle, squashing two nearby cars recently. Must have made of an interesting insurance claim, "yes that's right my car was hit by a boat"
Fortunately no local blogger or runner was injured in the event. 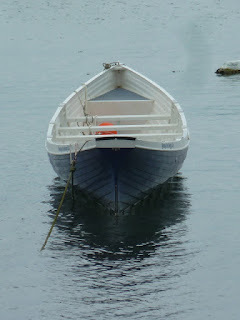 You know what it's like you go down to the boat to do a few jobs that really need attention. 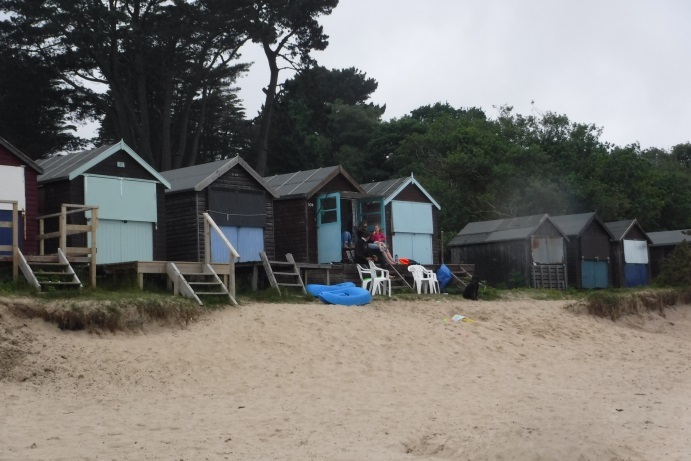 Controversy down at Studland bay, the National Trust for some reason want to demolish the Middle Beach Cafe, the Sea School buildings and adjoining toilet block, to replace the latter with - can you believe it portaloo's. 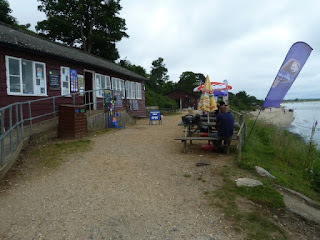 The cafe has been a popular spot with visitors for as long as I can remember, housed in some old wooden buildings which have matured nicely and fit in with the unspoiled surroundings. 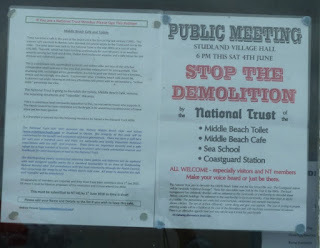 You have to wonder what's behind this plan by the National trust, the buildings are there, people like the facilities, why does it make any sense economically, environmental or aesthetically to start knocking them down? Middle beach at Studland is one of the nicest, unspoiled yet still accessible parts of our local coastline. The old wooden beach huts also add to the character of the place. 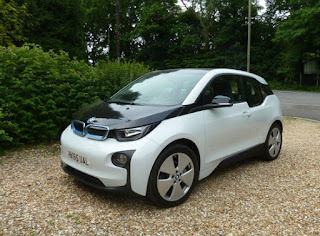 I had the chance to drive an all electric BMW i3 while my car was being serviced and it was an interesting experience. Push the pedal and it goes, take you're foot off and it stops. It takes a little getting used to, in fact the braking effect of the motor is so good that if you take your foot off like you would in a normal car it stops about 30 yards short of the lights. Overall it's so nice, quiet and easy to drive by the end of the day I was reluctant to give it back and drive home in my noisy and polluting diesel. When I picked it up there was only 28 miles of charge displayed on the star wars type instruments, as someone had forgotten to charge it the night before. 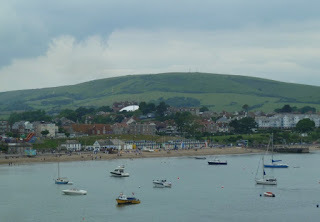 But I made it home and back with some 6 miles to spare, lucky I didn't need to stop off at the local supermarket. The range between charges is 125 miles and the batteries have a 5 year or 100,000 mile warranty. For a short range commuter car it would work if you're into leasing and replacing your car very three years or so, but doesn't sound like an attractive long term proposition. 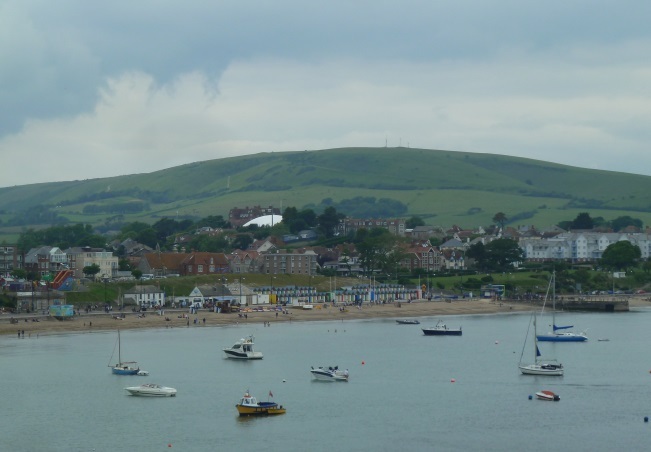 We had a weekend away down in Dorset and visited Swanage, originally a fishing village the town grew during Victorian times as a seaside resort. 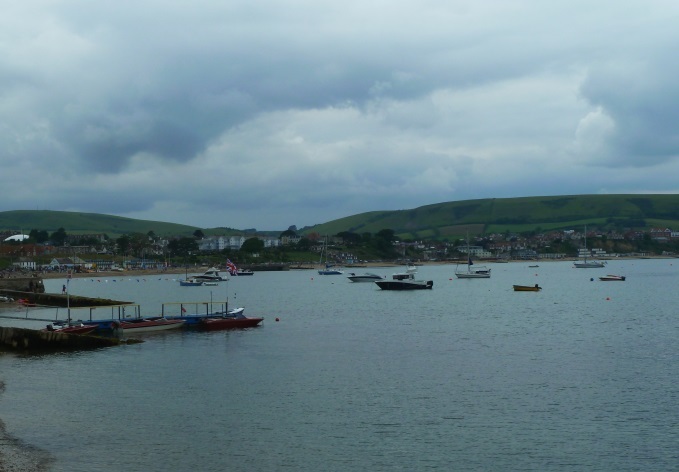 Nestled in the rolling Purbeck hills with the wide bay facing east and protected from the prevailing winds Swanage has that old fashioned charm. 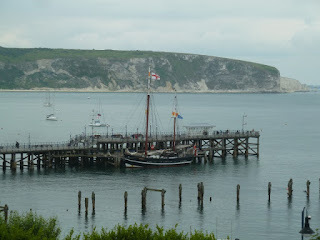 The pier is still active and home to a classic ketch which operates tourist trips. 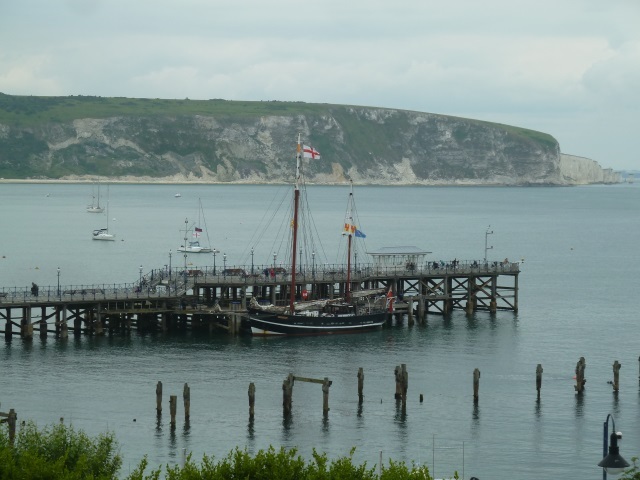 Anyone who trained as a BSAC diver in the south of England will probably be familiar with Swanage pier which provides interesting and relatively shallow open water, great for training. 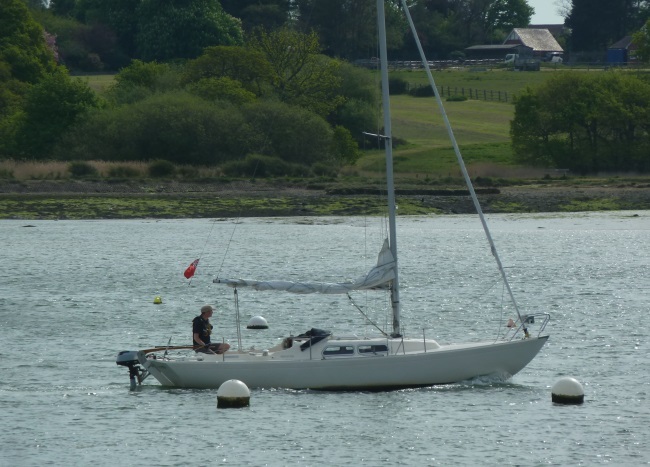 In anything except easterly winds the anchorage is normally calm and settles, but there can be quite a lot of noise coming off the beach.